Watch the amazing activity on the surface of the Sun while it really happens. 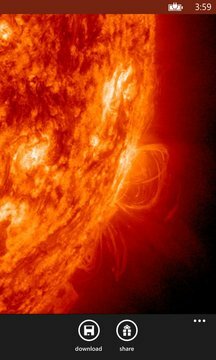 The Sun Live gives you the always updated images and latest videos from the Solar Dynamics Observatory orbiting the Earth and monitoring the Sun 24/7 plus the SDO Pick of the Week. 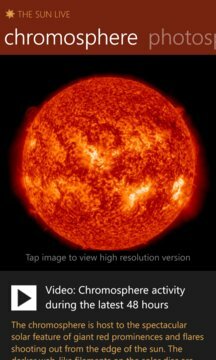 Hunt for prominences, flares and sun spots and save the most spectacular images and videos or share them through the share charm. As the Solar Cycle is close to its 11 year maximum, and the solar magnetic field according to NASA is going to flip during the next couple of months, our Sun is expected to display a lot of activity in the near future. Don't be left out of the action. Enjoy the fascinating facts about the Sun, learn more and get started observing the Sun yourself by following the tips and recommendations. The Sun Live can also update its live tile, so you always know what is going on with the Sun right now. All solar images courtesy of NASA/SDO and the AIA, EVE, and HMI science teams.